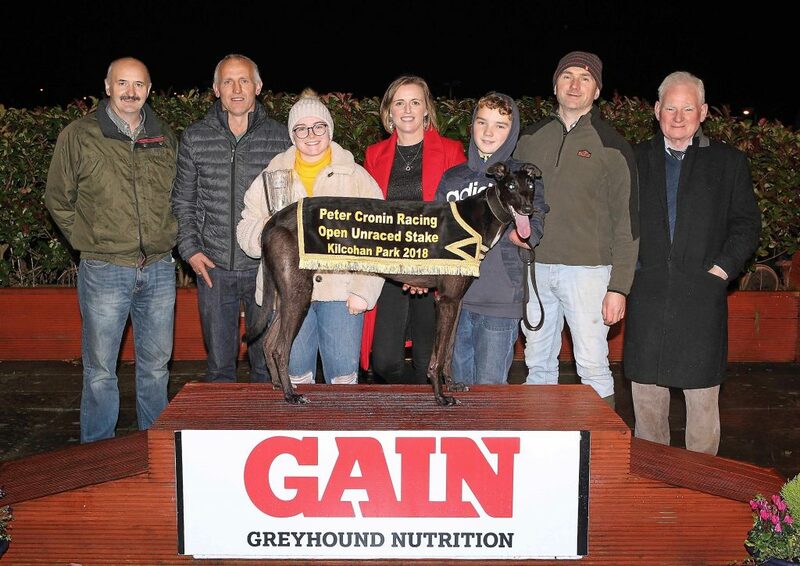 The winner of the Peter Cronin Racing Open Unraced Stake Final was Balintee Blaze and owner, Ellen O’Neill is pictured receiving her prize from Kathleen Lennon, Racing Manager, Kilcohan Park Greyhound Stadium, also included were Mike Cronin, Eamonn Murphy, Richard O’Neill, Peter Cronin, trainer and Jimmy Maguire, Chairman, Kilcohan Park Greyhound Stadium. Photos: Noel Browne. An eight race card featured the finals of the Peter Cronin Racing Open Unraced stake plus the consolation decider. The sponsor had three of the finalists but it was the outsider of the trio Ballintee Blaze 5/1 who led all the way in 28.76. With the market leader Crossfield Jay mistiming his break ‘Ballintee’ scooted into an early lead over Lemon Sydney. This order of running never altered thereafter with ‘Ballintee’ deservedly prevailing by three and a half lengths. The winning prize was €2,250. Race 1, A3 525: The Stephanie Goff owned Some Dogs Do 4/1 recorded the fastest return of the weekend leading all the way in a career best 28.52. Glenbrook View kept tabs on the early paced winner throughout but a determined ‘Some’ saw the standard trip out to the bitter end obliging by two and a half lengths. Race 2, A7/A9 525: Having her second race outing the James Duggan owned Suirview Vassa 3/1 made no mistake from a middle draw making every stride a winning one in 29.66. Leading early on from Aoibhinns Flyer ‘Suirview’ stayed on stoutly registering a one and a half lengths defeat of a running on Killiney Blaze. Race 3, A6 525: Packy Joes Lad held the early call but was challenged at the third bend by both Mikeys Whitty and Debs Oasis. Taking the outside route the SJC Syndicate owned Debs Oasis 6/4 struck the front between the final two bends before racing on to a well deserved three lengths defeat of ‘Mikeys’ in 29.27. 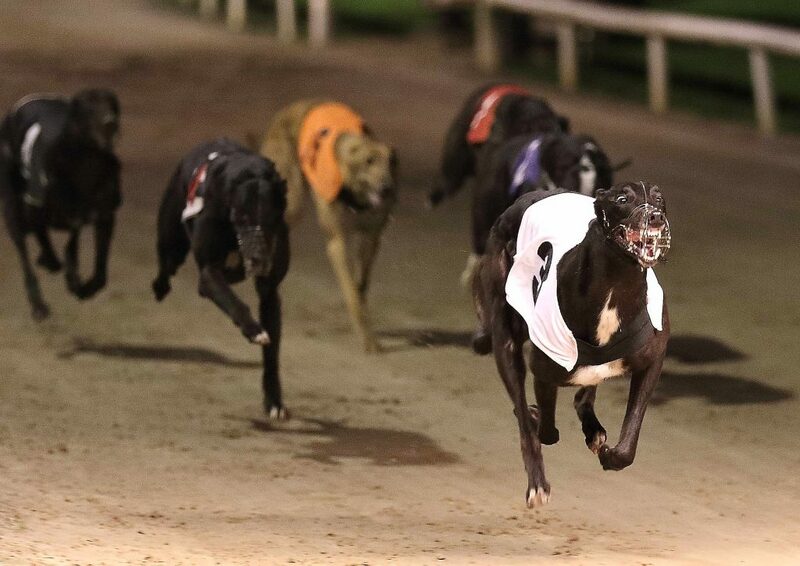 Race 4, A8/A9 525: Owner Richard Walsh Senior hit the target with his recent acquisition Drealistown Man getting off the mark at odds of 5/1 in 30.01. Seeing off a third bend challenge by Drealistown Tray Drealistown Man dug deep withholding the late charge of Suirview Tiber by half a length. Race 5, NO 525: In the unraced consolation decider the James Phelan owned Jays Gold justified odds of 1/2 with a facile pillar to post victory in 29.05. Scampering into an early lead over Shallows Pearl ‘Jays’ was never out of her comfort zone en route to a five and a half lengths win over a running on Honey Dubh. Race 6, NO 525: See introduction. Race 7, A4 525: Safe Ferrari and Leamaneigh Fort were prominent here but accelerating into a second bend lead on the wide outside Rathsilla Flo Jo the evens favourite was soon on course for victory number six. Safe Ferrari pushed the winner all the way but it was ‘Rathsilla’ who hit the winning line a length clear of ‘Safe’ in 29.33. Race 8, A2 525: Having her first race outside of novice company Cactus Swank 3/1 impressed with a no-nonsense early paced victory. Gliding into an early lead over Four Amigos ‘Cactus’ was soon on her way to an easy win in 28.78. In a one-sided affair ‘Cactus’ freewheeled to a comfortable six lengths defeat of Four Amigos. Ballintee Blaze in full flight.